Photo Blog - Niebrugge Images - Photo blog featuring Ron Niebrugge's outdoor, travel and nature photos. Black-headed grosbeak Yesterday at the Desert Photo Retreat, near Tucson, Arizona. 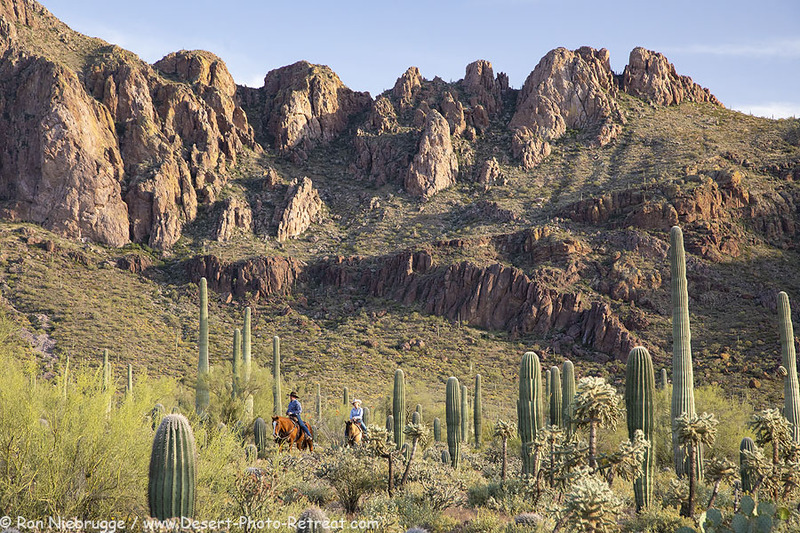 We are down to our last few weeks in Arizona at the Desert Photo Retreat and it sure has been busy! 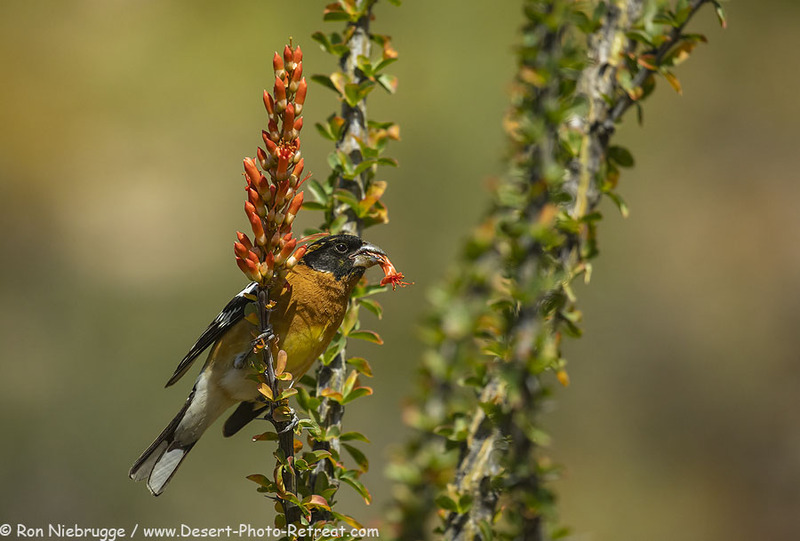 The migrating birds are in full swing; we are seeing black-headed grosbeaks, lazuli buntings, fly-catchers and orioles! The regular birds are all busy. Our nesting cactus wren and thrashers have fledged, but are still begging for food. As are the house finches. 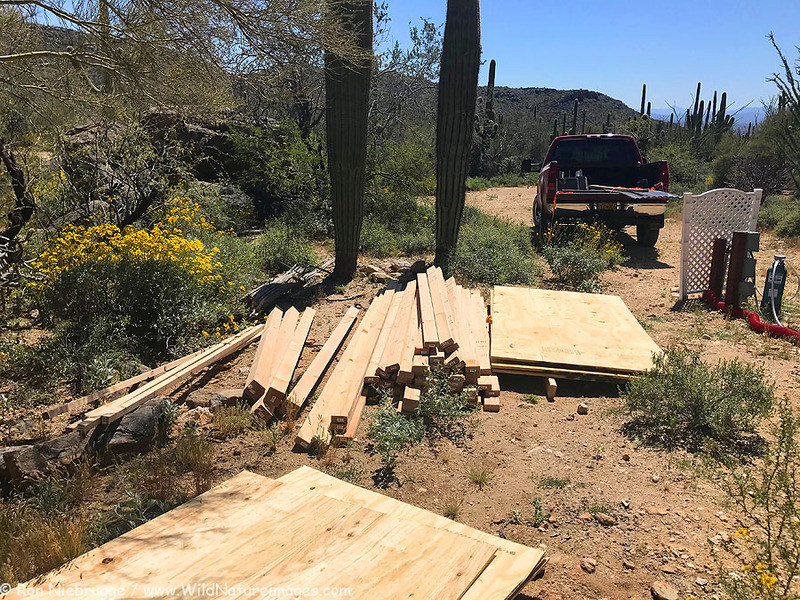 There is lots of noise coming from the cactus holes of woodpeckers and gilded flickers who nest on the property. Yesterday we hiked up and checked on the red-tailed hawk nest and it looks like they have two or three small chicks. I’m sure the same is true for the great horned owl. My logs tell me we should be seeing quail chicks any day now. The other wildlife is also active thanks in part to a wet winter. Lots of cotton tails and jack rabbits around. Last night our gray fox pair made 12 visits to the water hole, and at least once appeared together playing on a log. Joining them last night was a bobcat, and two skunks. Javelina took the night off. The wonderful wildflowers are beginning to fade, but now we are seeing cactus in bloom. We even have a handful of saguaros in bloom, with lots of buds showing. We have also been busy with photographers for nearly a month straight – the first one used the new morning blind yesterday and really liked it! It is going to be a welcome addition. Surprisingly, we have a few days available between now and our departure if you are interested in coming out for a night, take a look at the on-line calendar. And if not, I will certainly be taking advantage of this exciting time of year! Mission San Xavier del Bac, Tucson, Arizona. 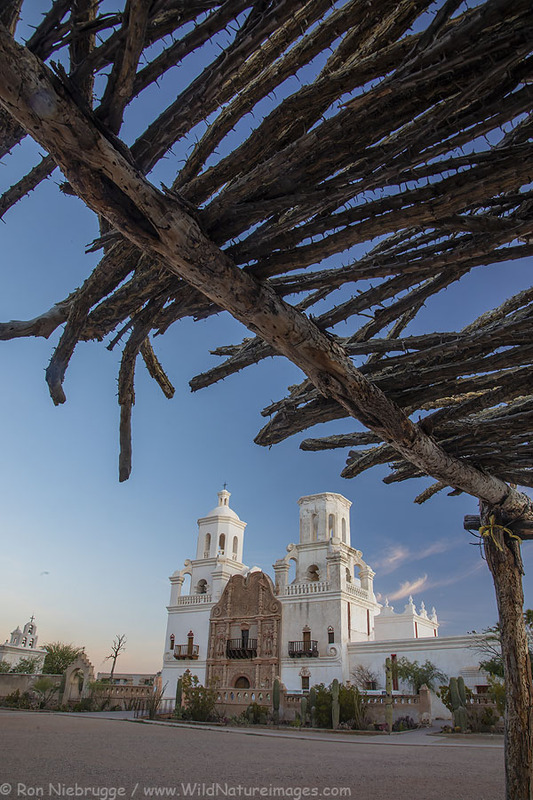 Another one from last weeks tour – Mission San Xavier del Bac, Tucson, Arizona. 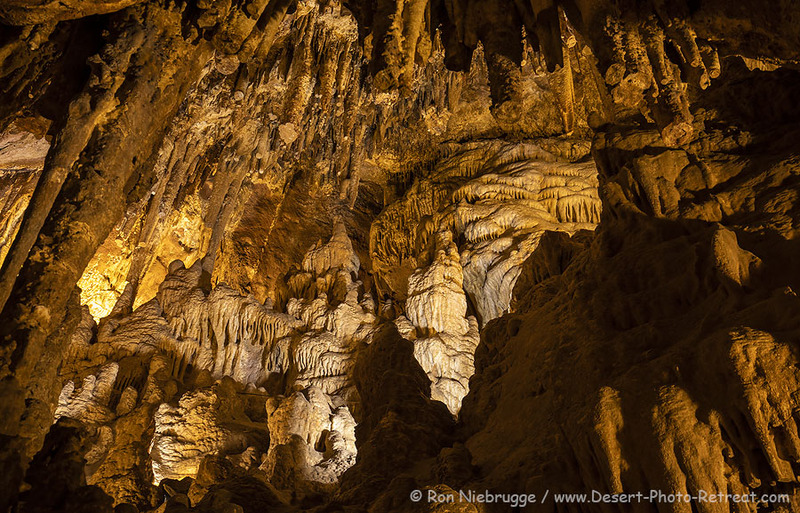 Colossal Cave Mountain Park, Tucson, Arizona. Just wrapped up a really fun Awesome Arizona Photo Tour! This was inside the Colossal Cave during our private tour of this cool location! Morning horse roundup, White Stallion Ranch, Tucson, Arizona. Another one from day one of the Awesome Arizona Photo Tour / Workshop. 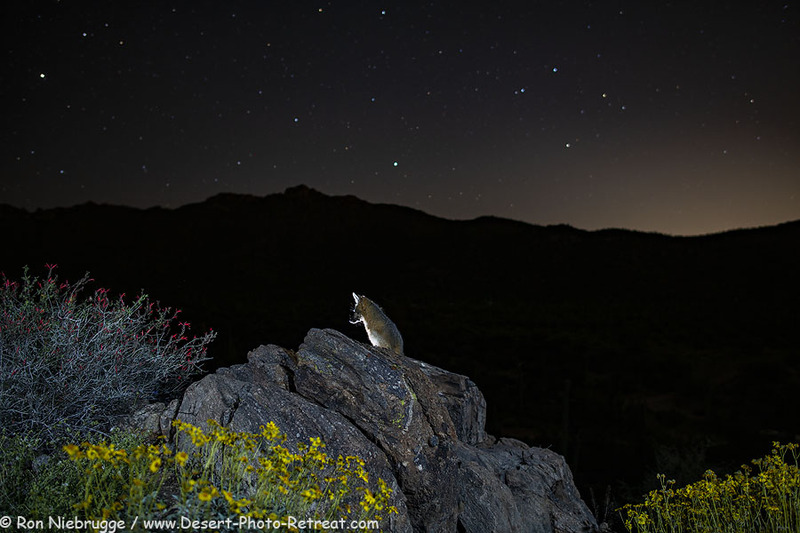 Gray Fox, Desert Photo Retreat, Tucson, Arizona. So my write up on yesterday’s post unfortunately was omitted. But as you may have guessed, last week a built a third blind, one with an elevated reflection water table that I’m really excited to try! I have also been trying to get some different fox images. I noticed the fox sometimes uses this rock out-cropping as a lookout over the canyon and our camp. So I decided to set my camera up there for something different. The fox makes multiple visits to the water hole every night, but this spot was not nearly as popular. I made many trips up and down the mountain in the dark with camera gear over three nights – one time at mid-night thanks to an unexpected rain, but last weekend he finally showed up! Next time I hope to get his whole body, but it is a good start. 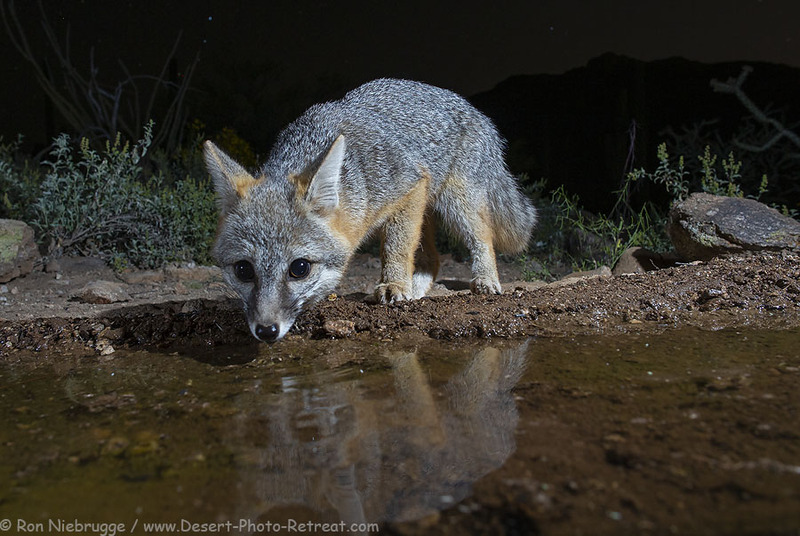 Been a very busy week here at the Desert Photo Retreat building a new photo blind along with a reflection water table! This one should be perfectly orientated for the morning light. A gray fox coming in for a drink the same night I captured the owl.